President Sirleaf presents certificate to a female graduate. Monrovia, Liberia - President Ellen Johnson Sirleaf has challenged the Civil Service Agency (CSA) to ensure that the President’s Young Professional Program (PYPP) extends its training in other limited skilled areas including entrepreneurs, engineers, doctors, and teachers, among others that can be absorbed in other government parastatals. 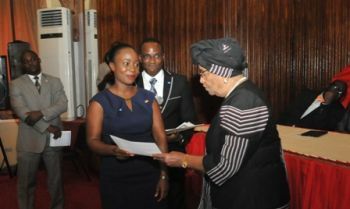 According to an Executive Mansion release, the Liberian leader made the statement when she made special remarks at the graduation of Class Four of the PYPP in the C. Cecil Dennis Auditorium of the Ministry of Foreign Affairs on Wednesday, April 8, 2015. Class Four constituted 15 graduates assigned at the Ministries of Finance and Development Planning, and Gender, Children and Social Protection, National Investment Commission, National Housing Authority, and the Liberia Maritime Authority; five have been awarded scholarships and are pursuing graduate studies in the People’s Republic of China and United States of America. President Sirleaf noted that since the launch of the program in 2009, government continues to receive encouraging feedback from ministries, agencies and others who interact with these young people; stressing that the Program has become one of the outstanding career development and leadership training programs for public service, as it continues to make an impressive impact on the work across Government. “Today we celebrate your accomplishment as the Fourth Class of PYPs. Collectively, you have successfully completed two years of service, mentoring, and training. We congratulate you for being there, for getting it done and for doing well,” the Liberian leader said. She challenge the graduating class to continue to be the refined examples that epitomize leadership. “This is only the beginning; we are counting on your commitment and expertise, and must remain focused on the long term goals with emphasis on integrity, professionalism and ethics for yourselves and country,” she urged. She announced that the graduating PYPs will be absorbed by the Civil Service Agency that is working closely with the respective ministries and agencies to finalize arrangements for their transition. President Sirleaf used the occasion to extend special thanks to all those local and international partners including John Snow Incorporated for ably administering the program and to the many donors who have contributed to the success of the Program, the Hess Family Foundation for its generous and continued contribution to support the Program’s ongoing operations and transition over the next five years, the Daphne Foundation, Humanity United, McCall MacBain Foundation, Nike, Open Society Institute, Mailman Family, and Simonds Family, IBI USAID – Governance and Economic Management Support Program (USAID-GEMS) as well as individual gifts and donations. “As we embark on the implementation of the Civil Service Reform and looking further ahead, you are strategic to the grooming of a professional, effective and efficient civil service,” she indicated, stressing further that while young people are often criticized in Liberia, and unemployment is highlighted as a major roadblock to both economic and social recovery, PYPP provides a timely and useful bridge from school to work that gives young people the needed opportunity to earn, even while they learn. Delivering the keynote address, the president and chief executive officer of the National Oil Company of Liberia (NOCAL), Dr. Randolph McClain, speaking on the topic: “The Role of Young Professionals in Liberia’s Development Process,” quoted a book, “The Bottom Billion” written by Paul Coulier which consider Liberia among many other countries in Africa as poor, falling apart, and failing. He said the author predicts that these countries will remain poor and in poverty for the rest of their generations, unless certain dramatically unusual steps are taken. Dr. McClain challenged the graduates to believe in the country and think “out of the box” to disprove the thinking of Mr. Coulier and break the barriers. “Your role is to be instrumental in removing the obstacles that make our country remain in poverty endlessly,” he emphasized and warned them that there will be no easy path. “You must believe that Liberia can and will achieve its vision,” highlighting government’s Vision 2030. He urged them to never give up, and believe that every second counts in this pursuit. “Find your passion in the pursuit of the development process and don’t let the large task ahead intimate you,” he admonished. The NOCAL chief executive officer encouraged the graduates to be confident as they contribute new ideas, fresh perspectives, and youthful energy to the professional environment in which they find themselves. “Your role as Liberian young professionals is to distinguish your country further by working with your new skills, in this appreciably reformed Liberian public sector, to reduce poverty amongst Liberians,” he urged. He urged the graduates to join their colleagues before them in the public service to make a difference to the people around them; demonstrate integrity and generate public sector management innovations; provide appropriate leadership and set standards and examples of public service that will endure. In remarks, the country representative of John Snowe Incorporated, Dr. Rose Macaulay, extended congratulations to the graduates and said that the PYP program provides a promising future for Liberia as it has become a premier program in the civil service that continues to equip young bright Liberians to succeed and lead by example. “JSI is proud to be part of this program. Thank you for your commitment, service and passion. We are proud of you and wish you success in your future career,” she said. For her part, United States Ambassador to Liberia, Deborah Malac, expressed delight at being at the graduation and she said it’s good to celebrate what’s good about the country. “The US Government is pleased to be a partner in this process,” she said, noting that this program was highlighted at the US-Africa Leaders’ Summit last August looking at ways that the U.S. together with governments in Africa can invest in the future generation of these countries and PYP is a prime example. Information Minister Lewis Brown and Deputy Minister for Youth Development, Saah N’Tow also made brief remarks. The PYP is a competitive two-year program for recent Liberian college graduates who have exhibited leadership ability, integrity and honesty and are committed to assisting with the reconstruction and development of Liberia. The PYP aligns with the national capacity-building program and its Liberia’s most competitive program for young people in leadership in civil service. The program creates career and professional growth opportunities for highly qualified Liberian college graduates, facilitates the transfer of knowledge from senior professionals to the next generation of civil service leaders, strengthens the capacity of Liberia’s public sector and its youth by providing professional training, mentoring and exposure for committed, talented and qualified young Liberians. The program’s long-term goal is to create the next generation of qualified professionals who are able and committed to working for the Government of Liberia thereby increasing public sector capacity and contributing to good governance and strong leadership. Currently the program has recruited 73 PYPs who continue to strengthen the capacity of 15 ministries and seven agencies with a gender breakdown of 44 percent female and 56 percent male.